Enjoy your own brew of coffee like never before whether you love cappuccino or cafe latte. In fact, you'll be amazed just how awesome your own blend would be, you won't have to leave home to go to a nearby cafe. Meet Dolce Gusto, the machine which makes coffee beautiful. Take your coffee time to the next level and get yourself the best deal on Dolce Gusto by grabbing a discount code plus other special offers. Get it cheaper when you shop from Ebuyer, B&M, Currys PC World, Groupon, Sainsbury's and Studio and get up to 60% off your purchase. 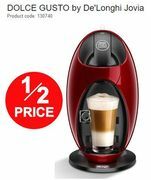 BARGAIN Nescafe Dolce Gusto Mini Coffee Machine - 60% Off! Enjoy a delicious treat every morning with the best Dolce Gusto deals & voucher codes! With their simplicity, flexibility and of course, good taste – single cup coffee brewers suddenly gained popularity. One perfect example of this is Nescafe’s Dolce Gusto – a trendy brewer that offers a soothing and great tasting coffee in just a snap. If you find yourself wanting to buy a unit to upgrade your very own kitchen, it is vital that you conduct a research before anything else. Nescafe Dolce Gusto is perfect if you are person with a busy and fast lifestyle. With this machine, you can brew a much-needed cup of coffee for about 15 seconds. That is the duration of time it will take until a mug of fresh coffee is served before you. Indeed, it is one of the fastest and easiest single cup coffee makers available out there on the market. Thus, it is supported by many because of the quality of coffee it can make afterward. The machine works by utilising pre-packaged coffee pods that are inserted in the slot. Eventually, they would start brewing the moment you click the button. Hence, this makes it the fastest machine on the market that heats up a coffee in just a minute. Apart from this, you also have a ton of types of beverages to pick from. Whether you want a hot or cold drink, this should not be hard to prepare. Check on Dolce Gusto and maximise its features. Buy any related product without hurting your budget and watch out for affordable deals on the web when making any purchase for some money off. Where Can I Get Best Deals for Cheap Dolce Gusto UK? If you are one who loves a good cup of espresso, or cappuccino, owning a Dolce Gusto machine is surely the best idea. In order to enjoy this, you can buy cheap Dolce Gusto pods or Dolce Gusto pods alternative to complete your coffee-making experience. Indeed, there are tons of ways you can go for when it comes to searching Nescafe Dolce Gusto pods bulk. There is a wide array of options you can pick for. Save money from your purchase and use affordable deals to your convenience and benefit. Make Dolce Gusto Jovia an important part of your kitchen. Check out cheap Dolce Gusto machine and use discount codes, special offers, freebies and sales here in Latest Deals. You can find Argos Dolce Gusto and Dolce Gusto compatible pods for a reasonable price. Get one from the retailers you trust such as Amazon, ASDA, B&M, Caffeluxe, Currys PC & more. We have a team of money-saving experts and a community of bargain hunters who are updated with affordable deals and offers in Dolce Gusto. Their aim is to assist our members in enjoying a massive amount of discounts from their purchases. Amazon. Find exclusive Dolce Gusto and Dolce Gusto compatible pods here at Amazon. It has a clever and easy-to-use pod system which is created to make you enjoy your coffee even more. If you are an eligible member for Amazon Prime, you can get a free delivery for this and additional discounts. Make the most of its exciting deals in store for you. ASDA. Own Dolce Gusto jovia and buy coffee pods & machines at ASDA. Watch out for all the fantastic deals and get coffee pods for as low as £12. Use discount codes and voucher codes to to save more from your purchase. B&M. Experience the great taste of coffee without spending a lot with B&M. Spend for as low as £3 on coffee, tea and hot drinks. Make coffee without fuss and ground coffee smoothly with Dolce Gusto. This is easier as you browse on the discounts and freebies of Latest Deals for its members. Debenhams. 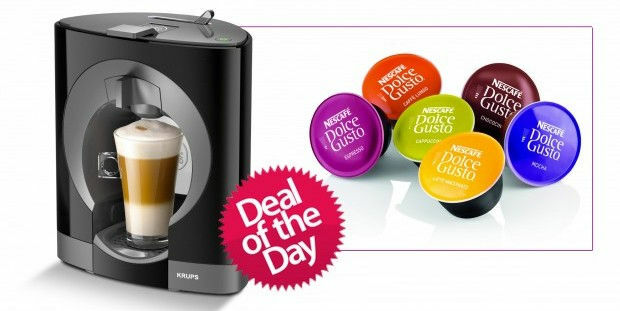 Enjoy the automatic machine, Nescafe Dolce Gusto, from the Sale Department of Debenhams. When it comes to coffee machines, you can select from three exciting changeable colours such as red, blue or green to make customise yours. eBay. Shop from an enormous inventory of Dolce Gusto coffee machine and pods from eBay. Buy any three or more and get a free delivery service. Aside from this, there are also capsule pods reusable available which are compatible to the said machine. Take advantage of sales and price drops to save extra from your transaction. These are just some of the retailers you can count on when it comes to Dolce Gusto products. You may also browse on Argos Dolce Gusto if you still want more selections to pick from. Making coffee is an art. If you are one who knows this very well, you should check on Dolce Gusto coffe pods and machines which are intended to ensure that your every sip of coffee is of oozing quality and style. Starting off with its espressos, to its gorgeous hot chocolate and latte macchiato, these kinds of coffee and beverages are surely going to suit your taste buds. You do not have to visit your favourite shops anymore. You can just make it inside the comforts of your home. What Can You Get from Dolce Gusto? Machine. The machine of Dolce Gusto is not only wonderful - it makes wonderful coffee as well. It is a full combination of functional technology with artistic design so that breathtaking beverages are produced every time. Among the different kinds of machines you can get from Dolce Gusto are Genio 2 Matte Black, Mini Me White & Black, Mini Me Piano Black, Oblo Dark Red and Drop Silver Automatic. Genio 2 Matte Black. This is a small and stylish automatic capsule coffee machine that fits any kind of kitchen design. Mini Me White & Black. If you are one who wants to save more space from your kitchen, this compact and ingenious machine is the right one for you. Mini Me Piano Black. Create the perfect drink in just a snap of your finger. This Mini Me Piano Black is distinctive in style and can give your coffee in an instant. Oblo Dark Red. Oblo is a stunning and modern machine that blends straight lines and gentle curves designs. Drop Silver Automatic. Drop sets the new standard for automatic coffee machine. With just a drop of coffee, you can create your beverage right away. Capsule. This capsule comes with an innovative technology and clever design that regulates the pressure which goes with it. It doesn't matter whether it is high pressure is necessary for a bold shot of espresso, or just a mere touch of milk in a latte macchiato. The drink is still going to be perfect and delicious. It is an understatement to say that Dolce Gusto is a must-have kitchen accessory for any person who loves coffee. It is another example of a single serve capsule coffee which is gaining popularity up until now. Grind beans and spoon out ground coffee without having a hard time at all. If you are still scouting for the best coffee maker, the big question is, why should you consider Dolce Gusto? What can you get from it? The Dolce Gusto coffee pods have a tremendous offer of flavours. You can select from a frothy cappuccino, down to a simple shot of espresso, depending upon your preference. Indeed, it dispenses a high quality of coffee that fits every taste and it may be obtained at a way lower price, as compared to that which you get from a coffee shop. You can do everything automatically with this machine, minus the part where there is mess. Just switch on the machine to fill up the removable water tank with cold water which is straight from the tap. Afterward, pop the capsule in and press the button. In just a few seconds, your hot coffee is ready. The maintenance of a Dolce Gusto machine is not a struggle. You can remove the water tank easily and empty it when not in use. You can also take away the drip tray and pod holder so that you can wash both individually. Newbies should also not worry because there are instructions provided that you can follow. This is how you can descale the machine. Since there are eighteen choices of gusto coffee drinks available, your taste will be addressed. There is one for all. Please note that when you purchase latte or cappuccino capsules, half of them are in milk pods so you can take advantage of as many coffees as you want from your money. Isn’t this a good bargain already? To sum it up, the Dolce Gusto has always been a top quality pod coffee machine that brings the a quality drink to your home. Customise your favourite hot or cold coffee now. Enjoy it without spending a lot.